The photos are distressing, but don't we owe it to the fallen to at least bear witness to what they have suffered? 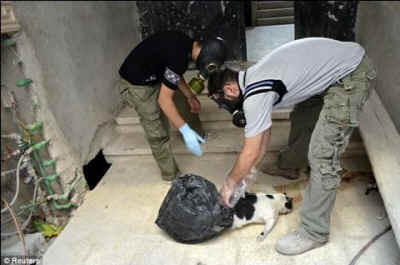 Hundreds of dead dogs and cats are among the casualties of the gas attack that left 1,700 humans dead in the Damascus suburbs of Zamalka and Ghouta. 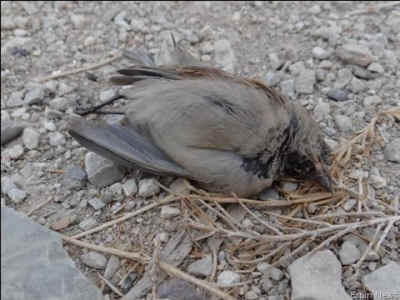 There's no complete record, but thousands, maybe millions, of animals – from squirrels and mice to sheep and goats to birds and bees – are among the dead. The photos are distressing, but don't we owe it to the fallen to at least bear witness to what they have suffered? In 2006, during the war between Israel and the Hezbollah, animal protection groups in Lebanon and Israel worked together to protect the nonhuman "collateral damage" from the bombs and shells. In the war in Bosnia in the 1990s, women from the opposing sides – Serbs and Croats – would meet up in secret to try to help the animals who'd been caught in the crossfire of the day's fighting. Doubtless there are people who find themselves on opposing sides of the war in Syria today and who are doing what they can to protect the animals. But if they live – or lived – in Zamalka, there are, sadly, fewer of them today.